Michael Tice has had solo exhibitions in Manhattan at the 55 Mercer Gallery, Sensory Evolution Gallery, the Gallery at Flamingo East, and also at the Time & Space, Ltd. Gallery in Hudson, N.Y. He has had solo exhibitions outside New York at the University of Alabama, Huntsville, AL, the Aiken Center for the Arts, Aiken, SC, and the Durham Arts Council, Durham, NC, among others. 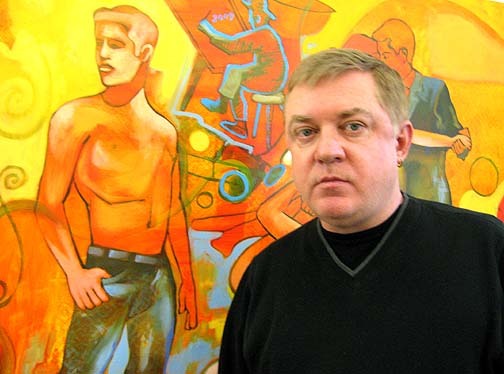 He has shown his work frequently in New York since the early 1980s, and has been featured in several curated exhibitions in New York at The Painting Center, Fashion Institute of Technology, The Durst Organization, Margaret Bodell Gallery, George Billis Gallery and in other group shows at Exit Art, Sara Meltzer Gallery, PS 122, and numerous other galleries and alternative spaces. Mr. Tice's work has appeared nationally in group exhibitions at the Stroud Foundation, Philadelphia, PA, the Greenville County Museum of Art, Greenville, SC, the Weatherspoon Gallery at UNC, Winston-Salem, NC, the French Library and Cultural Institute, Boston, MA, the North Carolina Museum of Art, Raleigh, NC, the Stamford Museum of Art, Stamford, CT, and the Minnesota Museum of Art in St. Paul, MN, among others. Mr. Tice received a BFA from the University of South Carolina, a two-month fellowship to the MacDowell Colony in Peterborough, NH, and has done graduate work at the University of North Carolina and New York University. He lives and works in New York.